Located along the Indo-Pak border, this village boasts of a number of significant heritage sites having a great historic and cultural value. However, they all are in a shambles and if the state government didn’t wake up to the importance of these sites and steps in to preserve them, they would soon become a part of history. Naushehra Dhala is associated with Bibi Sukhanji, daughter of Baba Gurbakash Singh who was a descendant of Baba Budhaji. Bibi Sukhanji was married in Chaudhary family of this village. She used to live in “mahal”, the royal palace of Chaudhary clan. However, this palace had been deteriorating over the last few years and in view of its dilapidated condition the local residents demolished it four years back. Now, at the site of the palace there stands a gurdwara which was built in the memory of Bibi Sukhan. During the era of Bibi Sukhan, the settlement was located within four "burjs" (small bastions/watch towers) of Naushehra Dhala. At present, only one of these four exists. This octagonal two storey structure is attached with rooms on two sides. This structure has traditional ceiling and wooden doors. The structure is built with Nanakshahi bricks. A historic mosque, which is located opposite to Burj, lies abandoned and is used for storage of straw for domestic animals. It is also constructed with Nanakshahi bricks in mud mortar and masonry joints sealed with lime mortar. Internal surface is not accessible since all the three archways on front side are closed with infill walls and entrance on side is blocked due to stored material. There are remains of wall paintings on the surface of front elevation. There is also a small circular historic well adjoining the mosque on east side. There is also a samadhi of Baba Jallahan, which is among the oldest structures with traditional Nanakshahi brick on edge flooring in concentric pattern. 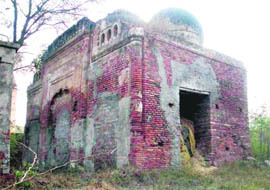 Meanwhile, Rachanpuneet Singh, a city-based conservation architect, has submitted a report on the state of these heritage structures in Naushehra Dhala to the Punjab Heritage and Tourism Promotion Board, highlighting the need to preserve them. “Naushehra Dhala is well connected with other places of cultural heritage and tourism potential in the region such as Wagah-Attari border which is thronged by tourists for retreat ceremony and Sarai Amanat Khan village known for its heritage value. There is a need to preserve the village’s heritage sites and subsequently tap the immense tourism potential that they offer,” averred Rachanpuneet.